Dolichoectasia is a term used to describe marked widening, tortuosity and elongation of an artery. Intracranial vertebral and basilar arteries are most commonly involved. Vertebrobasilar dolichoectasia is usually asymptomatic. Cranial nerve compression and cerebral ischemia findings are frequently seen in symptomatic patients. However, vertebrobasilar artery dolichoectasia with internuclear ophthalmoplegia (INO) clinical presentation has not been reported in literature yet. In our case, we report of a 67 year old female who had symptoms of diplopia, left abducens palsy and headache with no prior medical or family history of cerebrovascular disease. She has been presented with INO due to left vertebrobasilar dolichoectasia. Atypical presentation of INO is rare and vertebral artery dolichoectasia as the underlying aetiology, like in our case is even rarer and has not been seen in literature so far. Vertebrobasilar dolichoectasia (VBD) is a rare dilatative arteriopathy commonly affecting the vertebral arteries (VA) and basilar artery (BA) . In 1986, Smoker firstly proposed the concept of VBD. Clinical manifestations are usually various and non-specific. Ischemic stroke is the most common kind of manifestation, followed by brain stem and cranial nerve compression, hydrocephalus and cerebral hemorrhage. Severity of symptoms is usually related with the patient’s age and the location of lesions. The most common outcome of VBD is ischemic stroke mainly characterized by posterior cerebral ischemia . Previous studies suggest that cases characterized by the diameter expansion of blood vessels are more likely to result in stroke while compression symptoms can be found more common in cases featured by tortuous expansion . The most commonly symptoms are related with ischemic, hemorrhagic and mass effect of the lesion . The basilar artery was diagnosed elongated (“dolicho”) if at any point throughout its course the artery lay lateral to the margin of the clivus or dorsum sellae, or if its bifurcation was above the plane of the suprasellar cistern. Ectasia was considered if the minimum diameter of the BA was greater than 4.5 mm . Dolichoectasia of the vertebral or basilar artery can cause cranial neuropathies but INO due to the VBD is a rare entity. A 67 year old woman was admitted to the emergency department of a local hospital with headache and diplopia. The patient was taken to our neurology clinic for evaluation. She had essential hypertension history. Neurologic examination revealed limited adduction in the left eye and nistagmus in the opposite eye. Her ophthalmologic examination revealed mild gaze-evoked nystagmus in medial directions. Respiratory functions, body temperature, the blood count, C-reactive protein, serum glucose, erythrocyte sedimentation rate, thyroid function tests and the other hematological investigations were all within normal limits. We first performed computed cerebral tomography (CT) that revealed no ischemic area signs but also showed dilatation of the left vertebrobasilar artery (Figure 1). Patient was treated conservatively with anti-agregan and low molecular weight heparin was administered. However there was an improvement in neurological examination during hospitalization with disfagia, left side hemiparesia, impaired consciousness and respiratory distress. We performed brain magnetic resonance imaging of the patient and then CT angiography in our interventional neurology clinic. CT angiogram showed a severe fusiform dilated distal segment of the left vertebral artery and basilar fusiform aneursymal dilatation (Figures 2a and 2b) as well as a prominent left-sided vertebral artery dolichoectasia compressing the left side of the ventro-lateral portion of the medulla to the right. 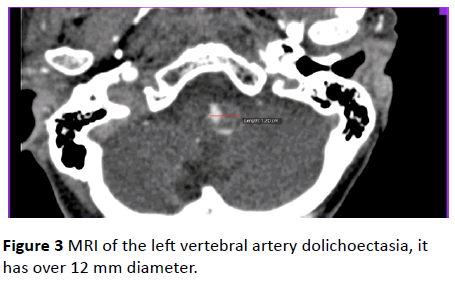 The left vertebral artery diameter was over 12 mm in magnetic resonance imaging (MRI) (Figure 3). There were no infarcts of the brainstem in diffusion - weighted ADC images of MRI (Figures 4a and 4b). Figure 1: Dilatation of the left vertebrobasilar artery on CT that has no ischemic area signs. 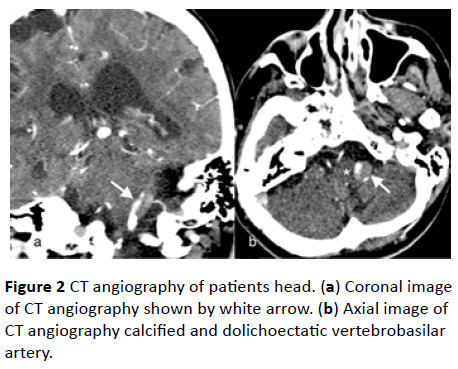 Figure 2: CT angiography of patients head. (a) Coronal image of CT angiography shown by white arrow. (b) Axial image of CT angiography calcified and dolichoectatic vertebrobasilar artery. Figure 3: MRI of the left vertebral artery dolichoectasia, it has over 12 mm diameter. Figure 4: (a) Diffusion - weighted and (b) Apparent diffusion coefficient (ADC) images of MRI, VBD impressing brainstem laterally at the pontomedullary junction. The patient continued to be treated in the Neurological intensive care unit for close to three weeks. During this period the patient developed pneumonia and respiratory failure. Mechanical ventilation and antibiotic therapy were applied however the patient did not recover. She died one month after admission due to respiratory complications. INO is a rare disorder of conjugate lateral gaze in which there is impaired ipsilateral eye adduction and contralateral abduction nystagmus secondary to a lesion of the medial longitudinal fasciculus (MLF). The most commonly identified causes of INO were vascular diseases, multiple sclerosis, infectious, head trauma, tumors and Chiari malformations. Rismanchi N et al. describe the case series of 3 children with bilateral INO as a consequence of extremely rare ophthalmologic finding in association with compression of brain tumors . By 1910, 4 clearly recognizable cases of INO and 4 cases of the one-and-a-half syndrome had been published in 1921, the year that Lhermitte named INO; Gordon Holmes wrote that he had seen only 2 dissociated medial rectus palsies in his career . VBD is an arteriopathy characterized by distinct dilatation, elongation and tortuosity of the basilar artery and the vertebral artery . Its prevalence in the adult population is estimated at 0.06–5.8% and affects most frequently the basilar and vertebral arteries, followed by the internal carotid artery and the middle cerebral artery . The occurrence of VBD may be affected by the congenital factors, immune factors and degenerative disease interacting. In the past atherosclerosis was considered to be the main risk factor of VBD but recent research suggests that this may not necessarily be the case . The etiology of VBD is not clear. The mechanisms responsible for the symptoms observed in dolichoectasia are: formation of the aneurysm with slowed down and multidirectional flow, compression of the brain stem and nerves by the widened and tortuous artery, recurrent thrombosis caused by turbulent flow, local or distal microembolisation, transient hypotension in a maximally compensated and autoregulated posterior circulation, occlusion of the pontine penetrator arteries . Most cases are asymptomatic. VBD may present itself with symptoms due to direct compression on cranial nerves causing cranial neuropathy, direct compression on brainstem, acute ischemia in the vertebrobasilar arterial territory and can be fatal due to vascular rupture . Rarely, the dilated and ecstatic basilar trunk may provoke obstructive hydrocephalus . Another uncommon issue in VBD is subarachnoid hemorrhage. Hemorrhage is associated with the degree of ectasia and the elongation of the basilar artery and may be favoured by hypertension and use of antiplatelet or anticoagulant agents [10,11]. The clinical manifestations are not entirely consistent with the severity of compression. Expansion of the basilar artery can directly oppress medulla oblongata and pons, causing transient or persistent symptoms in movement like; weakness, dizziness, ataxia, tingling, tinnitus, hoarseness, dysphagia, slurred speech, headache, etc. It can also impair the apnea and cerebellar ataxia with symptoms which can range from mild to severe . In this case, although there were no ischemic findings in brain MRI, the occurrence of this clinical sign suggests that it might have been an INO sign due to compression of the brain stem. INO that was seen in this case is also a rare clinical manifestation too. Cranial nerve neuropathies due to the compression of VBD is a frequent condition, but INO due to the involvement of MLF is generally caused by thrombosis of brain stem artery [13,14]. Even though an ischemic lesion was considered at initial presentation, MRI showed no evidence of ischemia. Vertical gaze palsies have been described in many studies and they have been related to ischemic midbrain lesions . In our patient, mechanical pressure due to the dolichoectatic vertebro-basilar artery might have affected the MLF and crossing fibers as MRI scans showed no evidence of ischemia. CT scan cannot fully demonstrate the changes of thrombosis within the blood vessel walls however if scans reveal calcification of the basilar artery, it could indicate the existence of VBD. Criteria of illustrating ectasia of the vertebrobasilar system in MRA was defined as arterial diameter >4.5 mm in any location along its course. As the gold standard for the diagnosis of cerebrovascular disease, DSA can not only show the lesion clearly, but also can be used as a method of treatments, although it means greater trauma and high-risk . However, the vascular hyperdensity that was observed initial brain tomography raised a suspicion about an ecstatic and trombosed vessel. The treatment of VBD includes medical and surgical treatment. VBD usually occurs in the deep part of brain and often involves the entire vertebral basilar artery so it’s very difficult to treat VBD. There is no systematic large-scale study for the treatment of VBD by drugs, surgery or interventional operation and a lack of large-scale randomized controlled trials for anticoagulation and antiplatelet therapy . Endovascular reconstruction of vertebrobasilar vessels can be another choice . In our case we could not use the surgical or endovascular therapy, we could use anticoagulation and antiplatelet therapy alone. Despite treatment, the patient's condition worsened and eventually died. Several studies indicate that VBD is a progressive disease where the most common cause of death is stroke. Approximately 43% of VBD patients, especially with rapid expansion, exacerbate during follow-up and the mortality is high . The long-term prognosis of VBD is mostly associated with the severity of the condition at initial diagnosis and on its evolution characteristics, which was associated with a higher mortality and morbidity . Accompanying neurological signs present in this patient, brain MRI clearly demonstrated close contact between the dolicoectatic vertebrobasilar arteries with the absence of ischemic findings of the brain stem. Dolichoectasia most frequently involves the vertebrobasilar arteries, and or basilar arteries. In our case, we report a rare case of dolichoectasia with INO clinical presentation associated with compression of the brain stem. This research paper is made possible through the help and support from everyone, including: parents, family, friends, patients and their families. Especially, please allow me to dedicate my acknowledgment of gratitude toward the significant advisors and contributors of this study. 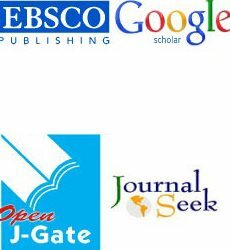 The product of this research paper would not be possible without all of them. Forster A, Ssozi J, Al-Zghloul M, Brockmann MA, Kerl HU, et al. (2014) A comparison of CT/CT angiography and MRI/MR angiography for imaging of vertebrobasilardolichoectasia. Clinical neuroradiology 24: 347-353. YafangXu BS, Lu Zhao, Yuan Gao, Hui Fang, YumingXu (2014) A review of vertebrobasilardolichoectasia. Life Science Journal 11: 388-393. Passero SG, Rossi S (2008) Natural history of vertebrobasilardolichoectasia. Neurology 70: 66-72. Yuh SJ, Alkherayf F, Lesiuk H (2013) Dolichoectasia of the vertebral basilar and internal carotid arteries: A case report and literature review. Surgical neurology international 4: 153. Lou M, Caplan LR (2010) Vertebrobasilardilatativearteriopathy (dolichoectasia). Annals of the New York Academy of Sciences 1184: 121-133. Rismanchi N, Crawford JR (2013) Bilateral internuclearophthalmoplegia associated with pediatric brain tumor progression: a case series and review of the literature. 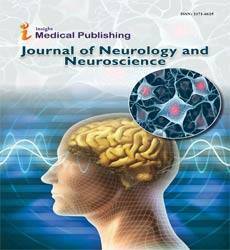 Journal of neuro-oncology 115: 487-491. Keane JR (2005) Internuclearophthalmoplegia: unusual causes in 114 of 410 patients. Archives of neurology 62: 714-717. Baran B, Kornafel O, Guzinski M, Sasiadek M (2012) Dolichoectasia of the circle of Willis arteries and fusiform aneurysm of basilar artery - case report and review of the literature. Polish journal of radiology/Polish Medical Society of Radiology 77: 54-59. Kansal R, Mahore A, Dange N, Kukreja S (2011) Dolichoectasia of vertebrobasilar arteries as a cause of hydrocephalus. Journal of neurosciences in rural practice 2: 62-64. Âengeze N (2013) Vertebrobasilarand bilateral carotid dolichoectasia: A rare entity. Turkish Journal of Cerebrovascular Diseases 19: 112-115. Takeuchi S, Takasato Y, Masaoka H (2009) Dolichoectasia involving the vertebrobasilar and carotid artery systems. J ClinNeurosci 16: 1344-1346. Savitz SI, Ronthal M, Caplan LR (2006) Vertebral artery compression of the medulla. Archives of neurology 63: 234-241. Giray S, Pelit A, Kizilkilic O, Karatas M (2005) Isolated abducens nerve palsy caused by contralateral vertebral artery dolichoectasia. Neurology India 53: 246-247. Giannantoni NM, Broccolini A, Frisullo G, Pilato F, Profice P, et al. (2015) Neurofibromatosis type 1 associated with vertebrobasilardolichoectasia and pontine ischemic stroke. Journal of neuroimaging : Official Journal of the American Society of Neuroimaging 25: 505-506. Ortak H, Tas U, Aksoy DB, Ayan E (2014) Isolated upgaze palsy in a patient with vertebrobasilar artery dolichoectasia; a case report. Journal of ophthalmic & vision research 9: 109-112. Wu X, Xu Y, Hong B, Zhao WY, Huang QH, et al. (2013) Endovascular reconstruction for treatment of vertebrobasilardolichoectasia: long-term outcomes. AJNR American journal of neuroradiology34:583-588.